I have a friend who recently had her hip replaced, another friend who is facing shoulder reconstruction and my brother just had back surgery. All because of intense chronic pain that limited their ability to fully enjoy life. Pain is enslaving. It is a constant reminder that something is wrong somewhere. Pain pulls our attention off others and directs it onto our own bodies, lives, inabilities, shortcomings, and limitations. Pain holds us back and keeps us down. Pain is a pain. Ugh. While I don’t have any major physical aches and pains (except on the days after I work out) – I am experiencing spiritual pain lately, and I know that surgery is necessary to remedy it – actually it is my only hope. So I’m in surgery even as you read this! No, I’m not in the hospital, I’m probably sitting in a comfortable chair with a book or Bible in my lap, or kneeling in the dark in my prayer closet. I’m undergoing heart surgery – there is no hospital, no scalpel, no anesthesia and no blood. This surgery is intensely painful, I’ve had it before on different areas of my heart, and I don’t enjoy it. However, I do know that once the surgery is complete, and the rehab is over, I will be pain free – until something else is uncovered that needs to be removed. While my friends and my brother could schedule the day that their pain was to hopefully end – and they could look at a specific length of rehabilitation exercises and physical therapy, my surgical schedule is wide open. It begins when I choose to work with God, and it will end when I die. OK – I’m being a bit sarcastic there – it will end when I choose submission to God’s way and obedience to do what he is telling me is best for me. In other words, my surgery (this time) will be complete when I lay down my will for myself and pick up God’s will for me. That is called “the cross for a believer” – where my designs for my life intersect with God’s designs for my life – and I must pick up that cross every day. However, the only way I can pick up that cross is to lay down my plans, my will, my desires, my thoughts, my rights, my my my my my. I can’t carry both. That causes too much pain. It shouldn’t be so difficult – I know who God is, I know he is good, perfect and always at work for my good. I know that he is the giver of all good things – so why do I struggle with letting go of the things I want to hold on to? Even if those things are causing me pain. Because I refuse to let go of the things I think I’m entitled to (like a hip, or a shoulder, or a spine that I was born with!) I experience disappointment. I am disappointed in myself, with other people, and with my circumstances. The definition of disappointment is when my plans are not the same as God’s plans. Disappointment is when I think my way is the best way, and God doesn’t get on board with my way. That said, I also know that when I let go of my plans – and my disappointment – and embrace the things God has for me I start to get excited about what’s ahead. However, in order to do that, I have to undergo heart surgery. 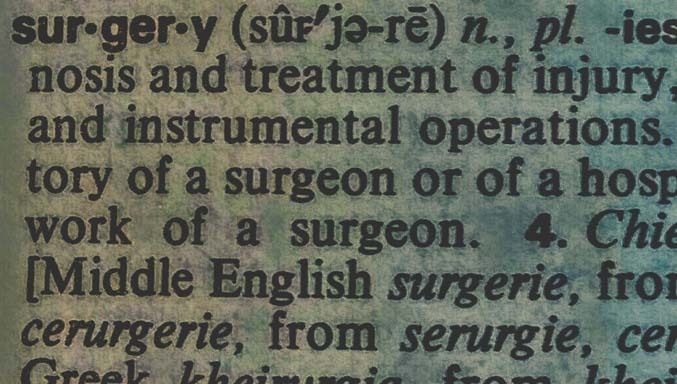 And, yes, it is surgery. Something must be cut out (like that hip!) and replaced with something new. Something must be shaved off (like that shoulder!) and tendons re-stretched and tied back together to regain strength. And something must be realigned (like a spine!) to strengthen the entire body. Spiritual surgery is not fun. The “thing” that causes me to sin, that causes me to focus on myself instead of the people around me, that enslaves me, that holds me back and keeps me down must be removed. That “thing” is almost always “pride”. I think I know what is best for me, and I want it. And, when I don’t get it, I experience pain. Are you experiencing the pain of disappointment? It can manifest in a number of ways: Depression. Loneliness. Bitterness. Unforgiveness. Heartache. Oppression. Are you ready for surgery? Will you let God cut out the things that cause you to focus on yourself, that enslave you, that hold you back and tie you down. Will you let go of your preconceived ideas of how your life should be and embrace what God has allowed for you? We must allow the “things” that keep us from laying down our plans and picking up God’s to be cut away. Then, not only will we live freely, we will live in excitement for what God has next. So applicable to me today. Thank you!